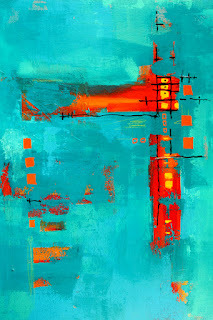 Thinking about the sea, ships, and the nature of the two prompted the color scheme of this abstract painting. The orange and red of rusty metal peeks through a tropical sea of turquoise and blue. The combination of warm and cool provides balance. The original painting was created with acrylic paints on a 20x24 inch stretched canvas. The 1.75 inch sides are painted black so it can be hung with or without a frame. Visit this link for purchase information. Reproduction fine art prints are also available here.